The Chinese characters in one of my programs, some of my filenames, and on some web pages are showing up as "??? ", boxes and other garbage characters. Do I need a Language Pack? Help!!! 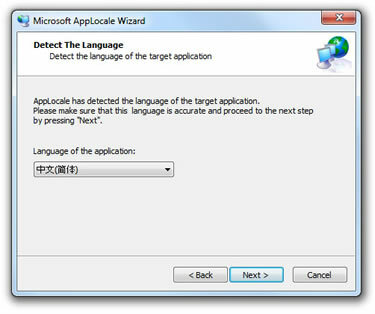 Chinese should display automatically in recent versions of Windows, or after you have enabled East Asian languages in Windows XP. No Language Packs or MUI bundles are necessary for this. If you see Chinese on some web pages but not all, or if Chinese in some but not all applications looks like the dialog box above, don't worry! You do not need to upgrade Windows. I have received this question regarding applications (like Sina UC, shown above), Chinese MP3 filenames, software from Taiwan and the mainland, even US versions of QuickBooks that used to accept Chinese characters in text fields until the user upgraded or moved to a new system. I also get the same question from people who see Chinese on some but not all Chinese websites. Most problems like these can be fixed with the solutions I describe below. You shouldn't need to do this for Baidu.com; the screen shot above is just an example. UTF-8 is a form of the universal Unicode encoding, and my browser had already selected this automatically based on Baidu's HTML header. You don't really need to know about the details of this stuff just to surf the Web, but if you are curious I've written an article about fonts and character sets in Chinese web pages, and for even more bedtime reading there's my summary of Chinese encoding standards. In Chrome, go to the menu, select More tools > Encoding, and try Chinese encodings specific to the region where the site is based. In Firefox, encoding choices are now on the toolbar menu (the three-line "hamburger" icon on the right), under Text Encoding. In previous versions it was on the classic menu at the upper left, under View or Web Developer > Character Encoding. In Internet Explorer 6, it was under View > Encoding. In IE 9, 10 and 11 on Windows 7 and earlier, the only way to change this seems to be via the tools (gear) menu > Internet Options > General tab > "Language" button, which is really inconvenient and not exactly what we want but at least it's there. In the Windows 8 tablet version of IE, the gear menu takes you to Settings > General > Display for an even more dumbed-down and less useful list, and I can't remember what happened in Windows 8 desktop. In Windows 10 the IE "Language" button only sends you to the system control panel to add more languages - not helpful - and I can't find language settings anywhere in the initial release of the Microsoft Edge browser. «Sigh.» But at least when you're on Microsoft websites the account settings (gear) icon at the upper right of the web page includes language localization options. In Safari, the last time I looked, at the top right I clicked the little page icon and in the menu there was "Text Encoding". Most other browsers offer the same options as well. If you need help finding this, contact me anytime. The following suggestions are primarily for applications created in and intended for a Chinese locale, i.e. 100% Chinese language systems. If your problem is only with filenames, skip the emulator section and see the section on changing the system locale. QuickBooks won't be helped by locale emulators. Skip to the second option here on changing the system locale. Outlook can behave strangely if you also try to use it for English messages. See my article on how Outlook behaves when you change the system locale. Chinese applications developed for Windows XP or earlier may require you to make changes to a couple of Registry key values yourself. See "If neither option works" at the end of this article. Locale Emulator is a free utility for Windows 10, 8, and 7 SP1 released under a GNU General Public License. 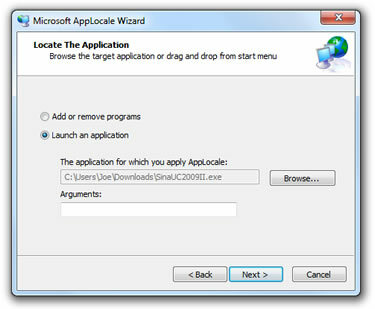 Locale Emulator installs in your right-click context menu, and allows you to trick most applications into believing they have been launched in a system running under different regional settings. Microsoft AppLocale is a free utility Windows 7, Vista, and XP. It runs a simple "wizard" to help you trick applications into thinking they are being installed or launched under different regional settings. You can also create a desktop shortcut or Start menu item that allows you to run an app this way anytime. See my note below about possible problems installing as an Administrator. I have not experimented with Locale Emulator yet, and can only refer you to the Locale Emulator website. You can use AppLocale to run an application once, or you can have it create a shortcut to run the app with these settings every time. You may need to run AppLocale as an Administrator the first time you use it on an application, but after a shortcut is created any user can run it. By default it drops the shortcut into AppLocale's folder in the Start menu. From there you can move the shortcut wherever you want. AppLocale will nag you every time you start it, telling you that this is a "temporary solution" and that you can change your entire locale instead. Duh. Just ignore that. After installing, the next step is to run the AppLocale wizard on the Sina UC application itself, and create a shortcut that always runs the app using the Simplified Chinese locale settings. Every time you launch it, AppLocale will pop up a little message saying that Microsoft considers this a "temporary solution", but yeah right it's been "temporary" since at least 2003 and this problem is not going away anytime soon so just dismiss that message and keep using AppLocale. Sound like a plan? Then go ahead and download AppLocale from Microsoft! You can't right-click on the installer to get a "Run as Administrator" option, so if you get that message your best option is to follow these instructions on installing AppLocale from the command line. If you are trying to run Chinese applications created for use only in China, or if some of your Chinese filenames won't display correctly on your system, often your only choice is to change the locale for your entire system. 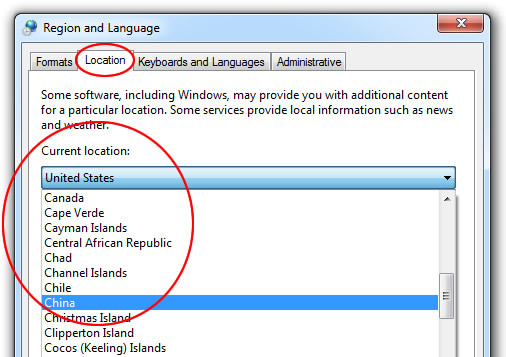 Some software is so tied to China that you will also have to change the location. Those are two different settings. 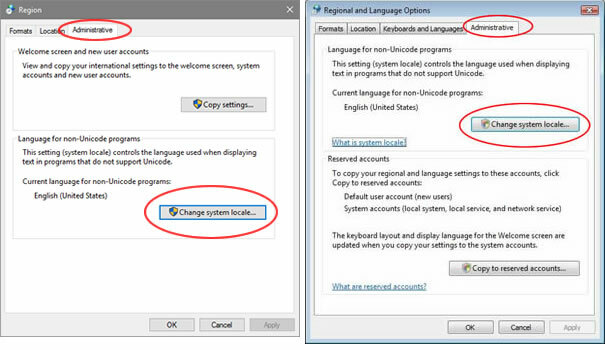 • change the locale only, using the the instructions below. These changes are not permanent, you can reverse them. If other applications begin behaving strangely you can switch this back to the original setting with no permanent damage...with one small exception: some programs select their display language the first time they run and will not change again unless you uninstall and reinstall them with the system locale set to the language you want. Go to the Windows 7/Vista/XP Start menu, or the Windows 8 desktop Charms menu, and click on "Control Panel". • in Windows XP Classic view double-click on "Regional and Language Options". In XP Category view click on "Date, Time, Language and Regional Options". • in the desktop interface, follow the instructions below. • in the tablet interface, this is under Settings > "Change PC settings" > "Time and language" > Region and language", and then "Country or region" (not display language). The rest of these instructions apply to the desktop only. 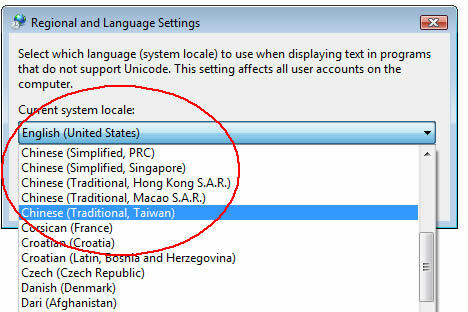 In the drop-down menu, change the system locale to Chinese (Simplified, PRC), Chinese (Traditional, Taiwan) or whatever language you need. Then click "OK" as needed to get back out of the control panel, and restart your system. After restarting your system, try running the Chinese application. If some or all of the Chinese is still not displaying correctly, the next setting to experiement with is in the "Location" tab of the same control panel. Don't do this unless you must, because many of your other applications and services may start showing you China defaults in places you may not expect. As I said, these changes are not permanent, so if you encounter unexpected settings or annoying instability in other applications - like Chinese characters showing up where they don't belong - you can always switch back. I recommend changing these back to your home locale and location each time you install new software unless you don't mind if it installs entirely in Chinese. I was forced to have some fun with all Chinese menus in what I had thought was a US-only version of a Nero disc buring app (it was good practice for me, I guess) but eventually I uninstalled it and then reinstalled with the system locale set back to English. Many thanks to Jody Leung for figuring this one out! Questions? Suggestions? Contact me anytime.